I’m not really sure why it took me so long to start sharing my Amazon finds considering how strong the Amazon addiction is over here. My husband frequently calls himself the “box boy” because I’m constantly getting Amazon purchases delivered. Whoops! But… Amazon has everything so, whatever! 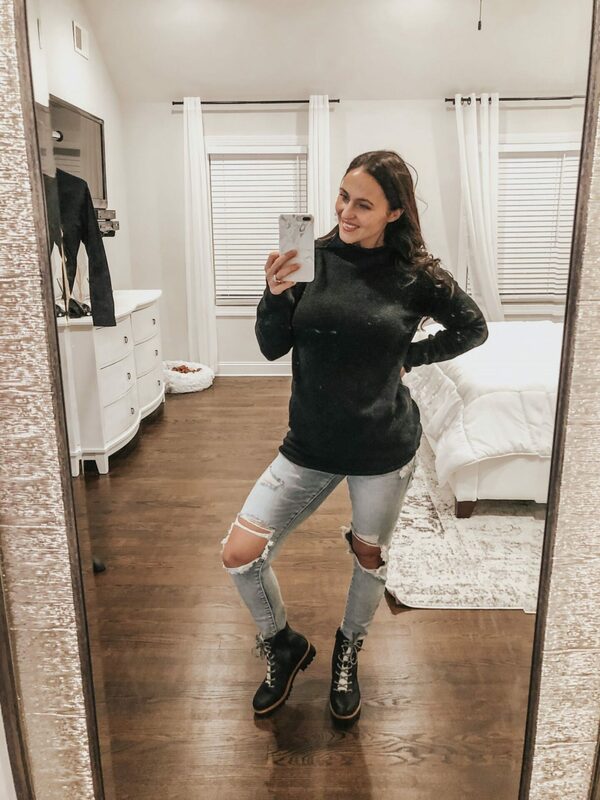 For every Amazon Clothing Haul I do I’ll also have the try-ons saved as an insta-story and highlight on instagram so be sure to follow me there. I’ll be doing these hauls towards the end of the month every month and everything will be linked for easy shopping. If you have any questions feel free to reach out! Ok so this top is one of my all time favorite tops. Apparently it’s most of my followers as well as it’s been one of my biggest sellers to date and I just posted it last week! Aside from the fact that it’s perfect for nursing (those are real buttons) it’s also long enough for leggings. I sized up to a medium for the oversized fit. You can see in the photo that the sides of the top come up quite a bit. I have a super long torso and if I hadn’t sized up it would have been a belly shirt every time I lifted my arms. It comes 8 colors and also comes in a short sleeve version (I have that one also and it is just as amazing). My jeans aren’t Amazon but you can find them here. They’re my new favorite pair! Ok so this sweater is on the very high end of what I would spend on an Amazon sweater but I’m telling you, it’s worth it! I noticed some reviewers said certain colors looked nothing like the photo but the green definitely does! I’m very tempted to go back for at least one more color. It’s super soft and not the least bit itchy. I love the neckline and the length is perfect. For reference I’m 5’4″. Ok so I love the print on this one but I wished I sized up to a large. It’s comfortable and also comes in red and blue. It’s a prime item and also a free return if you don’t love it or need to exchange for a different size. It’s a great top for just bummin’ around on the weekends. LOVE THIS DRESS!!!! I’m going back for the white because it is so amazing! I could have went with the small for the waist but I sized up to a medium for the length. I think if I went with the small it would have been too short. The tie front is so flattering and I don’t see why you couldn’t tie it to the back if you wanted to. The balloon sleeves give it a dressy vibe but the material is casual. This one could easily be dressed up or down. It comes in 11 colors and I’d say it’s the best dress for under $25 I’ve ever purchased! My shoes can be found here. 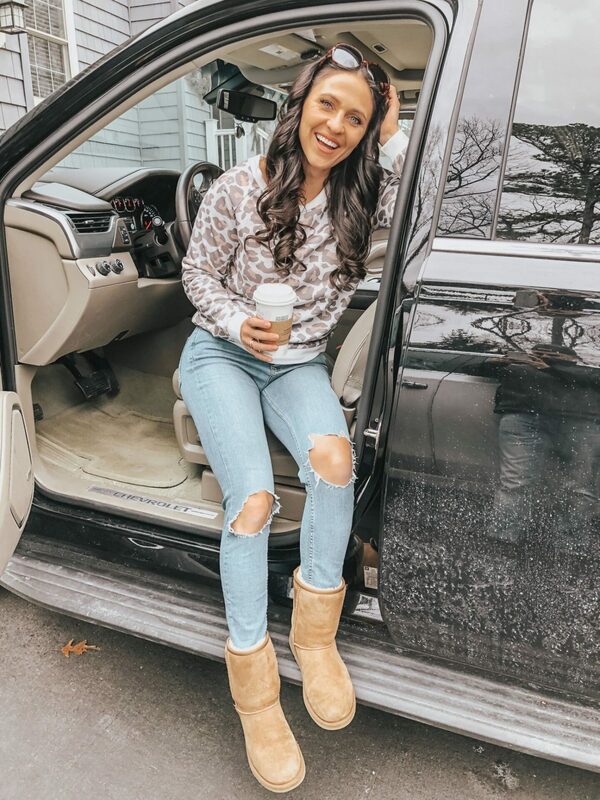 This month was a really great Amazon month….LOVE THESE BOOTS TOO!! I originally saw them on Macy’s or another dept. store but found them on Amazon much cheaper. The tongue is faux fur, they tie all the way up the front and there’s also an inner zipper. I worried that they might be too heavy but they are so light and comfortable! I have no idea what’s on my mirror in this pic, sorry! I’m not normally one for a bold design or stripe but I loved the combination of colors on this sweater (also comes in 3 other colors). It fits oversized and I proably could’ve went with a small but I’m just as happy with the medium. 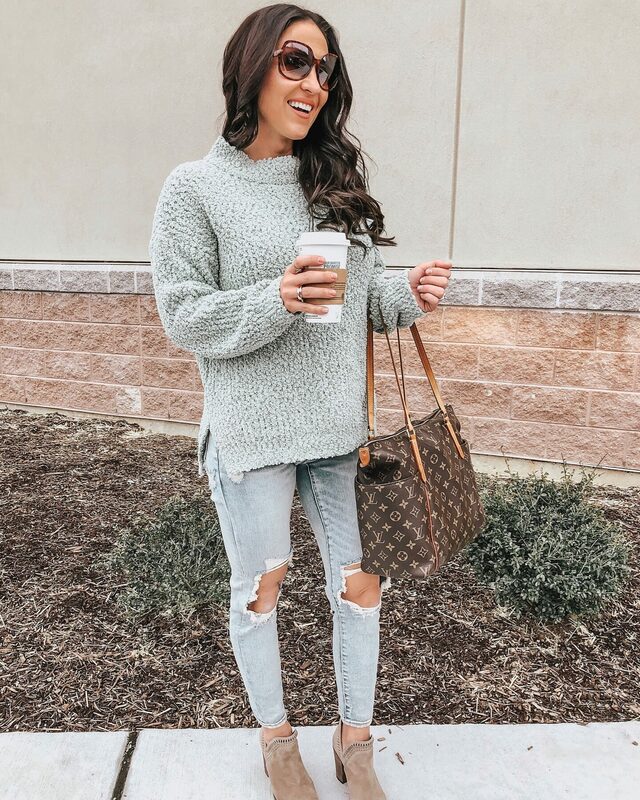 I love longer sweaters and this one is perfect. It’s high quality and I’m not worried about it falling apart in the wash. it’s not prime but I got mine in 3 days and it also comes with free return shipping if you need to send it back. Another style that’s a bit out of the ordinary for me but I thought it was too cute not to try. This dress is more of a loose/flowy fit and would easily transition into spring with a pair of wedges or flip flops. It comes in 2 other colors (really love the red) and the material is really light (not itchy or stiff). It’s amazon prime and there is free return shipping. I definitely would NOT size up on this one. Also, I apologize for the horrible lighting. That’s not a smudged mirror, it’s the sun LOL. I promise, the baby was totally fine. They were playing peek-a-boo 🙂 This vest is another one of my favorite purchases this month. I feel like I have a lot of those ha! I read the reviews and was hesitant on ordering but I’m glad I went with my gut. I’m comfortable in the medium and feel that it fits true to size. I saw one reviewer write that they couldn’t detach the carrying pouch that comes inside but I had absolutely no trouble with that…. mine was attached in a way that made it very easy to be unattached so I’m thinking it was user error on her part lol. This vest isn’t going to keep you warm but that wasn’t my plan anyway. It’s too cold here in NJ to wear just a vest in winter, whether it’s heavy or not. I like it paired over a thermal like I have it worn above but you could style it so many different ways. This thermal is from a few years ago but you can find a similar one at the top of this post! My sneakers can be found here..
That’s it for my January Amazon Clothing Haul! I hope you found some stuff that you liked. If you have any questions about sizing, material, etc. feel free to leave a comment or shoot me a message on instagram! Share this Amazon Clothing Haul on Pinterest via the image below! Click here for more fashion posts.